We went to the big swap meet yesterday. We were once again disappointed because it seems like the swap meet has definitely moved away from the farming emphasis that it had in years past and instead is now more focused on flea market and yard sale type sales. That’s not to say that we didn’t find things. I found five metal freezer baskets, and when I told the seller I was not using these for decoration but would actually be using these on our farm and in our freezer, she let me have them for $3 each which is definitely a real steal! I also found a trash can that matches the one I already have in the downstairs bathroom. They don’t actually look like trash cans because they were originally sold to be outdoor candle holders, but I loved the look and used it as a trash can in the bathroom. Now I have a matching set, and I will definitely put candles in them for a table display. I picked that up for $4, and I think I originally paid $16 for the first one so that was a really good deal, too. Some of the booths have brand new items, and I found something my dad will love so I got it for him for Christmas. One more gift marked off my list! Ted and I were talking as we were leaving, and he was disappointed that we did not see more farming items as well. It seems like what we did see that would be considered farming or homestead items had been priced high for the antique pickers who always come to these meets. Also, any farm or homestead items that we saw also had quite a bit of rust on it; that meant it couldn’t be used to go along with our milking or anything we do food wise. We did see one thing worth mentioning though micro mini pigs! These were really cute! What was funny was that the seller started off telling us these would only get up to 35 pounds maximum as adults, and when Ted said that was too small because we’re looking for the ones to eat, and miraculously he suddenly had some that were going to get to 200 pounds as adults! Lol We passed on the micro mini pigs. 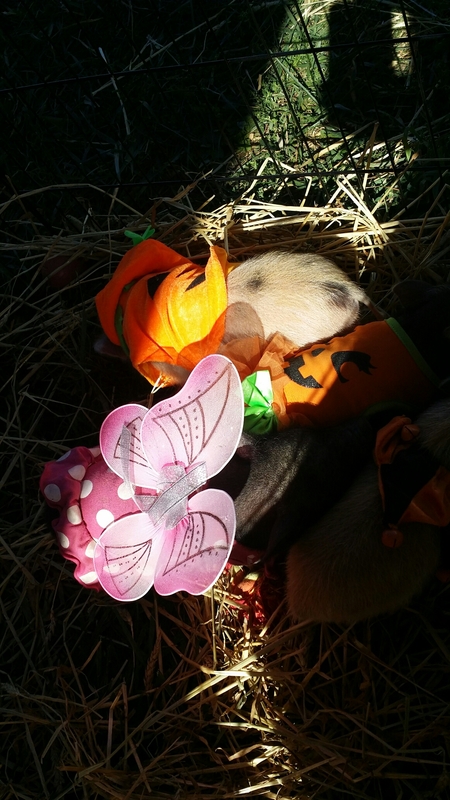 We were not swayed even by their cute little Halloween costumes that they were wearing.